UNRCPD had a busy end to 2013 with two major conferences addressing issues of security, non-proliferation and disarmament in the Asia-Pacific: the annual disarmament and non-proliferation conference in Jeju, Republic of Korea, with a focus this time on UNSCR 1540, and the Second Asia Regional Meeting to Facilitate Dialogue on the Arms Trade Treaty. To learn more about these events, see the latest issue of the UNRCPD Newsletter. Other issues addressed within this edition of the Newsletter include UNSCR 1540 in the Asia-Pacific context, the UNRCPD Peace and Disarmament Education project in Nepal, UNRCPD’s presentation to the First Committee of the UN General Assembly, the visit of UN High Representative for Disarmament Affairs Angela Kane to UNRCPD’s office in Kathmandu, and more. To keep up-to-date on UNRCPD and its activities in the region, follow us on Twitter @UNRCPD. 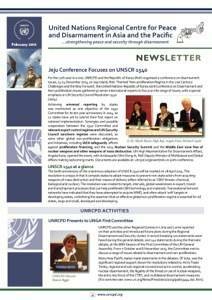 We hope you enjoy the current issue of the UNRCPD Newsletter.